Chinook tents are designed for wind and rain. Aerodynamic tent designs and full rainflies with covered doorways or vestibules make these leisure tents more functional in wind and rain. Chinook only manufactures dome tent models. They do not manufacture cabin tents. Families who leisure camp at higher elevations, in windy regions or in rainy climates may well find that these tents perform better than family cabin tents. The smaller 3-man models can also be used for backpacking. Full-length rainflies and breathable tent canopy walls also make Chinook tents more comfortable on cooler evenings. Factory-taped full rainfly and floor seams mean that the tent may not need any spot sealing to prepare it for camping. A 2000mm-coated polyester rainfly performs in a heavy downpour. This is a much more weather-proof coating than most family tents offer. The 2000mm-coated polyester floor fabric resists water seepage. 3 poles support the dome tent body on most standard Chinook models, increasing performance in moderate to strong winds. Large roll-back, side-opening doors with large, #10 zippers open easily. Storm flaps with medium-size, #8 zippers on all windows close to seal out rain and wind. Ceiling peak mesh panels allow humidity to exhaust from the tent body. No-see-um screening keeps tiny flying insects out of the tent. Sleeve and clip attachments secure Chinook tent bodies to poles. Web and loop attachments connect the poles to the tent base. 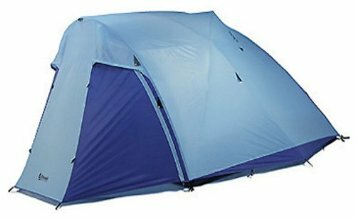 These tent models include a gear loft for storing gear off of the floor. Campetent rates the aluminum-poled Chinook tents as 3-season tents to perform in fairly strong winds and rain. We rate the fiberglass-poled Chinook tents as 2-to-3-season tents to perform in moderate-to-strong winds. Chinook standard tent models have a lifetime limited warranty against manufacturer defects. 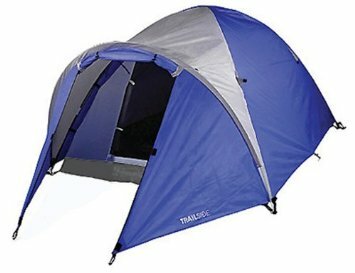 Chinook Trailside tents are designed for campers looking for an economical dome tent with a full rainfly and vestibule. The Trailside models offer 1000mm-coated polyester rainflies to shed rain. 2 fiberglass poles support the tent body offering economy and performance in moderate winds. A polyethylene (tarp-like) tent floor resists ground moisture. Campetent rates Chinook Trailside Tent models to perform in moderate to strong weather. Chinook Trailside tents have a 1-year limited warranty against manufacturer defects. The Chinook Tornado 6 is a 3 pole square dome tent with a full rainfly around the sides and back. The third pole of the tent body supports the tent canopy over the front door, giving it a more vertical angle. The front of the tent body employs the same weatherproof fabric as the rainfly. The tent body clips to the poles. 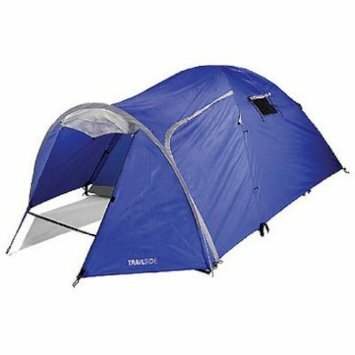 The Tornado tent body consists of breathable fabric with a large triangular mesh panel in the ceiling and a 1' wide mesh panel strip around the lower tent body. A large brim over a fairly vertical doorway protects the tent entrance in the rain. The steep angle of the doorway along with the lack of a vestibule eases entering and exiting the Chinook Tornado tent. The tent body dimensions are 9'4" wide by 9'7" long by 6'3" high. Roll-back, side-opening doors at the front and back of the tent body lead into the tent. Mesh panels around the perimeter and at the peak of the tent body alternate with solid breathable fabric to offer high/low venting and protection from wind. A clear panel near the peak of the fly allows light into the tent. At the back of the tent the rainfly stakes out away from the tent body to form a small vestibule to store excess gear. A vertical zipper allows the rainfly to open to access the back door of the tent. The Chinook Tornado tent can be pitched back into the wind to allow access to the front door while minimizing rain in the entryway. The 88 square feet of floorspace is rated to sleep up to 6. The Tornado 6 should comfortably sleep 2 adults and a child. The Tornado 6 offers standing height at the peak which will allow adults to dress standing up. 2 doors are unusual in a family dome tent of this size and offer more access between the tent body and the outdoors. Extra stake-down points at the base of the tent and rainfly as well as guyout points on the rainfly help stabilize the Chinook Tornado in strong winds. Campers looking to get the most performance out of the tent in strong wind should consider the aluminum pole version. The Tornado tent body suspends from the frame entirely by clips to speed setting up the tent. The Tornado 6 will fit on a 10' by 10' tentpad. The Chinook Tornado 6 Tent with aluminum poles weighs 18 lb. The Chinook Tornado 6 Tent with fiberglass poles weighs 20 lb. The Tornado 3 is identical to the Tornado 6 but with smaller dimensions. The tent body is 5'10" wide by 7'1" long by 3'11" high. The 41 square feet of floorspace is rated to sleep up to 3. The Tornado 3 offers kneeling height and should comfortably sleep 1 adult or 2 young teens. The Tornado 3 is a suitable second tent for family camping. It can hold a couple of young teens looking for their own space. The Chinook Tornado 3-Person Aluminum Pole Tent weighs 7 lb. 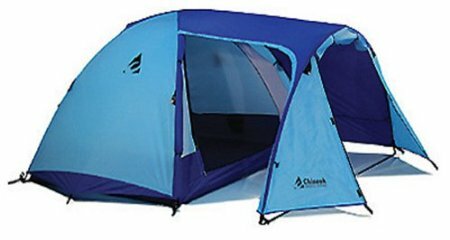 The Chinook Tornado 3-Person Fiberglass Pole Tent weighs 9 lb. Return to standard tent models at top of page. The Whirlwind Tent is a 2-pole, rectangular dome tent featuring a large oversize vestibule. A flexed hoop pole supports the rainfly away from the front of the tent body to offer a large vestibule with full headroom. At 70 square feet, the Whirlwind vestibule area is as large as the tent body. Roll-back doors at the front and back of the tent body offer good access for a family. Doors on the front and side of the vestibule allow for multiple configurations to adapt to wind and rain. The vestibule is large enough to be a sitting room. This vestibule design is popular with touring bicycle campers, who want to keep the bicycle inside the tent out of view at night. A roll-up door panel at the front of the vestibule can instead be tipped up and supported with poles to form an awning. A roll-back door at the side of the vestibule creates a large opening to the vestibule. A ridge pole runs along the center from the back of the tent to the vestibule. The ridge pole supports the rainfly to form a peak over the back door. The tent body dimensions are 10' wide by 7' deep by 6' high. The 70 square feet of floorspace is rated to sleep up to 5. The Whirlwind 5 should comfortably sleep 2 to 3 adults. The tent and vestibule can be oriented either to avoid strong wind or to funnel a light breeze into the tent body. A separate door at the back of the tent body leads outside via a zipper at the back of the rainfly. The back of the rainfly stakes about a foot away from the tent base to create a small covered area. The Chinook Whirlwind 5 with aluminum poles weighs 17 lb. The Chinook Whirlwind 5 with fiberglass poles weighs 19 lb. a more heavy duty floor fabric in the tent body to resist rough ground and foot traffic. a detachable floor in the vestibule, which turns it into extra sleeping space. no-see-um screening, as well as solid fabric, in vestibule doors, which turns the vestibule into a screen room. Chinook Whirlwind Guide 5 with aluminum poles. Chinook Whirlwind Guide 5 with fiberglass poles. The Whirlwind 3 is identical to the Whirlwind 5, only smaller. The tent body dimensions are 7'6" wide by 6' deep by 4'4" high. The 45 square feet of floorspace is rated to sleep up to 3. The Whirlwind 3 should comfortably sleep one adult or 2 young teens. The Chinook Whirlwind 3 Aluminum Pole Tent weighs 9 lb. 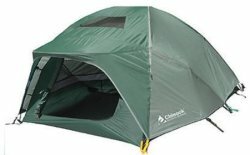 The Chinook Whirlwind 3-Person Fiberglass Pole Tent weighs 11.5 lb. The Cyclone Base Camp 6 tent is a tall 3 pole dome tent with a large vestibule. A full rainfly completely covers the entire tent and, along with a separate hoop pole, forms a large supported vestibule over the front door. The rainfly also stakes away from the tent body in the back of the tent to form a smaller vestibule. A vertical zipper opens the rainfly to allow access to the back side-opening door of the tent. The large, full height, roll-back door in front of the tent allows tall campers to walk into the tent body without stooping. A door on each side of the large 17 square foot front vestibule offers choice of entry into the tent on the side protected from wind and rain. The 3-pole tent body dome features a tall, vertical, roll-back door for easy access into the tent for tall campers. A 4th pole supports the rainfly away from tent body to give the front vestibule good headspace. The tent body dimensions are 8' wide by 11' deep by 6'2" high. Solid breathable tent body walls help retain heat and avoid drafts on cool evenings. A mesh ceiling panel controls humidity and condensation inside the tent. The floor is heavy duty 150 denier Oxford nylon coated to 2000mm for better resistance to wear and moisture. A removable divider wall across the center of the tent body separates the tent into two chambers, each with a door. Doors in the front and back of the tent body offer easy entry for fully occupying the tent. The back of the rainfly stakes down about 2' away from the base of the tent, creating a back vestibule for storage. The Cyclone Base Camp 6 Tent should comfortably sleep 3 adults or a larger family with young children. The tall tent body along with the hooped front vestibule give the tent a snub-nosed look. The Chinook Cyclone Base Camp 6 Tent with aluminum poles weighs 22 lb. The Chinook Cyclone Base Camp 6 Tent with fiberglass poles weighs 24 lb. The Cyclone 3 is similar to the Cyclone Base Camp 6 but with smaller dimensions. The front vestibule is not supported by a 4th pole. The floor is not heavy duty Oxford fabric, but standard fabric. The tent body is 5'8" wide by 8'2" long by 4'2" high. The 46 square feet of floorspace is rated to sleep up to 3. The Cyclone 3 offers kneeling height and should comfortably sleep 1 to 2 adults. The Chinook Cyclone 3 Tent with Aluminum Poles weighs 8.5 lb. The Chinook Cyclone 3 Tent with Fiberglass Poles weighs 9.5 lb. 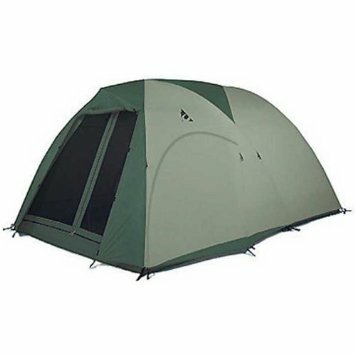 The Twin Peaks Guide 6-Person Tent features a double-dome design with 2 overlapping dome tent bodies under 1 rainfly. A full rainfly protects the tent body against wind-driven rain. The tent body dimensions are 9'4" wide by 13'8" long by 6'9" high. An inverted "T" door leads to the front 9'4" wide by 5'3" deep screenroom dome. In front of the doors, a roll up storm panel in the rainfly zips closed to seal out wind and rain. The panel can be unzipped at the sides, tipped up, and supported by poles in front to form an awning over the entryways. The sides of the rainfly over the front dome unzip and can be rolled back to expose the side screen panels of the screenroom. Mesh front and side walls in the front screenroom allow ventilation and a view free from insects. A removable polyethylene (tarp-like) floor in the screenroom allows the use of camping chairs without fear of damaging floor fabric. The tent-body ceiling fabric runs from the peak of the front dome to the peak of the back dome to extend the headroom at the center of the tent. A roll-back door at the back of the screenroom leads to the back bedroom dome, which is 9'4" wide by 8'5" deep. Mesh panels at the peak of the bedroom ceiling allow warm, humid air to exhaust. A heavy-duty 150 denier Oxford nylon floor coated to 1200mm resists wear and standing water well. A door at the back of the tent exits to the outside. The 128 square feet of floor space is rated to sleep up to 6 people. The Twin Peaks Guide should comfortably hold 3 adults. The double dome design allows the tent to feature a large integrated screen room as well as gives it the ability to shed rain and wind. The Chinook Twin Peaks Guide 6 Tent with aluminum poles weighs 25 lb. The Chinook Twin Peaks Guide 6 Tent with fiberglass poles weighs 28.5 lb. The Twin Peaks 6 tent body will fit on a 15' x 15' tentpad. However, the length of the rainfly may extend a few inches beyond 15'. With a bit of ingenuity, it should be possible to pitch the tent on a 15'x15' tent pad and stake the front and back of the rainfly just off of the pad. The Twin Peaks Guide 4 Person Tent is identical to the Guide 6, except for smaller dimensions. The tent body dimensions are 7'10" wide by 12'5" long by 6' high. The front screen room is 7'10" wide by 5' deep. The 100 square feet of floor space is rated to sleep up to 4 people. The Twin Peaks Guide should comfortably hold 2 adults. The Chinook Twin Peaks Guide 4 Tent with aluminum poles weighs 22 lb. The Chinook Twin Peaks Guide 4 Tent with fiberglass poles weighs 24 lb. The Twin Peaks Guide 4 Tent will fit on a 15' x 15' tentpad. The North Star 5 Tent features a standard 2-pole square dome design. A full polyester rainfly coated to 1000mm with factory sealed seams protects the tent body from rain. A flexed fiberglass pole forms a hoop in front of the tent body to extend the rainfly and form a vestibule over the door. The vestibule stakes away from the tent body to offer 27 square feet of storage space. A roll up panel accesses the front of the vestibule. The panel can be tipped up instead to form an awning. A roll-back door leads to the tent body. The tent body dimensions are 8'2" wide by 9'2" deep by 6'3" high. A mesh panel at the peak of the ceiling of the tent body exhausts humidity. Solid fabric tent body walls help prevent drafts on cool evenings. On warm evenings, campers may need to open up the tent in order to stay comfortable inside. The 76.5 square feet of floorspace is rated to sleep up to 5. The North Star 5 tent should comfortably sleep 2 to 3 adults. This economical Chinook Trailside tent is available with fiberglass poles only. A polyethylene (tarp-like) bathtub floor resists standing water around the tent. The tent body attaches to the pole frame almost entirely with clips, speeding set up time. The Chinook Trailside North Star 5 Tent weighs 15.5 lb. The North Star 3 Tent is identical to the North Star 5 Tent above, but smaller. The tent body dimensions are 5'7" wide by 6'9" deep by 4' high. The 38 square feet of floorspace is rated to sleep up to 3. The North Star 3 Tent should comfortably sleep 1 adult or 2 young teens. The 6'9" wall may be a bit cramped for many adults to sleep along, however this is a suitable second tent for young teens who want their own camping space. The vestibule offers 19 square feet of covered storage space. The Chinook North Star 3-Person Fiberglass Pole Tent weighs 7.5 lb. Return to Trailside tent models at top of page. The Long Star 6 Tent is a 2 pole square dome tent with a long, oversize vestibule supported by a hoop pole that sits away from the tent body. The tent body dimensions are 10' wide by 10' deep by 6'3" high. A factory-sealed, full rainfly covers the tent and vestibule area. The oversize vestibule offers 40 square feet of covered space in front of the tent body. A roll up panel leads into the vestibule from the front. It can instead be tipped up to form an awning. A second door on the side of the vestibule can be opened for greater access or a wider view from the tent. A roll back door leads from the vestibule to the tent body. 2 small mesh screens in the upper tent body ventilate the tent. Vent flaps in the rainfly open to allow air into the tent shell. A polyethylene (tarp-like) bathtub floor resists any standing water around the tent body. The 97 square feet of floorspace is rated to sleep up to 6. The Long Star 6 should comfortably sleep 3 adults or a larger family with young children. The Chinook Long Star Tent is available only with fiberglass poles. The Chinook Trailside Long Star 6 Tent weighs 21 lb. The Long Star 3 is identical to the Long Star 6, except with smaller dimensions. The tent body dimensions are 7' wide by 7' deep by 4'2" high. The 49 square feet of floorspace is rated to sleep up to 3. The Long Star 3 Tent should comfortably sleep 1 to 2 adults. The vestibule offers 23 square feet of covered space in front of the tent body. The 7' walls may be a bit cramped for tall campers. The Long Star 3 Tent is suited for family camping mainly as a second tent for teens seeking their own camping space. The Chinook Long Star 3-Person Fiberglass Pole Tent weighs 9.5 lb. Chinook tents offer full rainflies, aerodynamic designs and large vestibules to protect family campers from adverse weather. They are popular with leisure tent campers in mountainous and exposed regions. Please note that Campetent does not own this tent model. Campetent strives to research and to provide accurate information for site visitors, but cannot guarantee every detail. Tent models are subject to feature changes over time. Tent campers should always perform due diligence to verify any important features before purchasing a tent. The author hopes that the information provided in this article will go a long way towards that goal. This tent is not rated for wind. In moderate to strong winds, campers themselves will need to judge when the tent has reached its limit in resisting the forces of nature. The tent has a limited warranty that covers defects in materials and workmanship. As with all tents, campers should carefully examine the materials and workmanship and make sure that they are satisfied before using the tent.